Turquoise around is much more than any other color of precious stones. Her many shades, tones and halftones depict a world of joy and fun. Throughout almost the entire history of mankind, both the gem itself and its color were considered to bring peace, harmony and true happiness. The Indians believed that this stone from the sky had the ability to drive away evil spirits and to bestow health. Turquoise color is widely spread in the cultures of the whole world, because it energizes the human soul, giving it serenity and tranquility. It is the unique equilibrium of turquoise that makes it the undisputed leader in color. Turquoise, which is dubbed the "summer shadow", is suitable for any season, unless, of course, to use it correctly. There are many colors that can be called shades of turquoise - from aquamarine to blue-green. 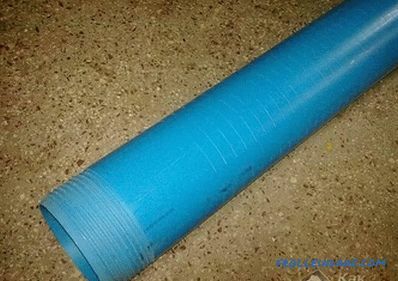 One can argue endlessly about the subtleties of the names of various combinations of blue and green colors, but everyone agrees with the fact that turquoise has a special aura. The turquoise color in the interior of the living room, even in the form of small contrasting elements, will give it a special charm and originality. 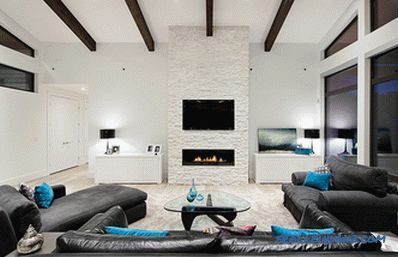 A minimalist living room in black and white with contrasting turquoise cushions. 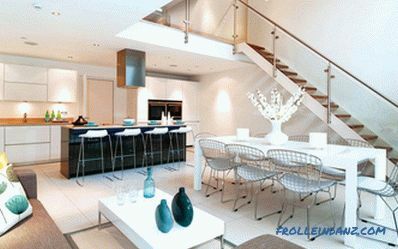 A beautiful modern interior in white with bright turquoise accents. Photo: Abbe Fenimore from Studio Ten 25. Black and white print, elegantly combined with bright turquoise accents. 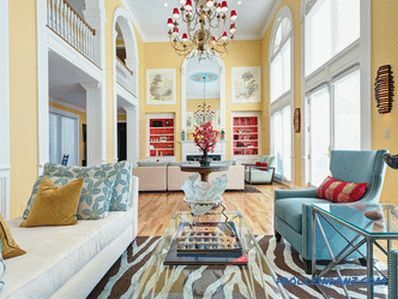 An elegant carpet plays an important role in giving color to a neutral interior. 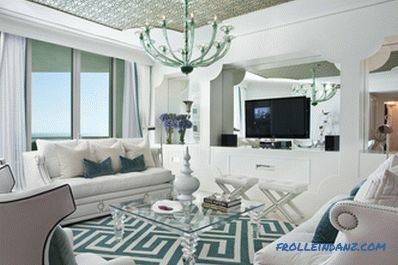 Hollywood Regency (“Old Hollywood”) style interior in white and turquoise. 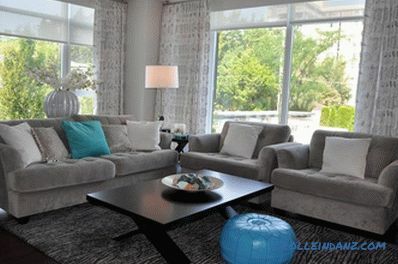 A green sofa together with turquoise cushions and glossy vases create color contrast in the interior. 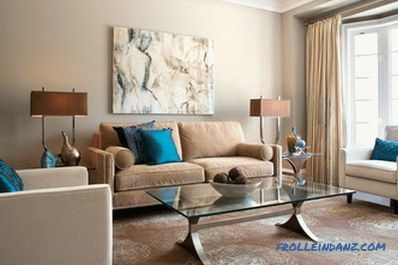 A stylish bedroom in white and chocolate brown with an accent in the form of a turquoise couch. 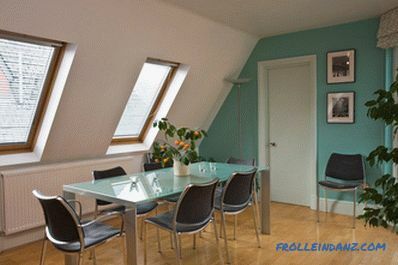 A panel on the wall helps to further emphasize the obvious turquoise accents. Photo: Positive Space Staging and Design. The neutral white base is the perfect canvas for turquoise blotches. Add some wind, waves and clear sky to your interior! The romantic image of white sandy beaches and greenish-blue sea water, associated with an unforgettable vacation, hides the obvious charm of turquoise. When painting a part of our house in a turquoise color or just adding appropriate accents to it, we often try to simply recreate this idyllic image. 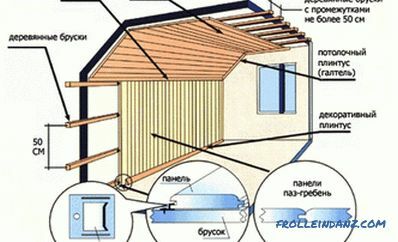 However, to create such a paradise in his home, it takes a lot of skill. 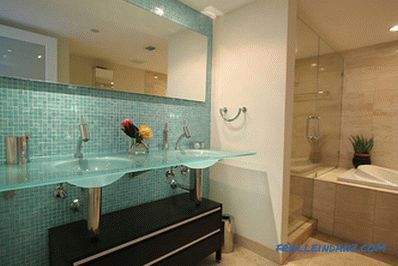 Turquoise, aquamarine, greenish-blue and many other options ideally fit into almost any interior. Although many believe that the place of turquoise - in interiors made in vintage or rustic styles, it is ideal for modern interiors. The bright turquoise legs of the table clearly attract attention. 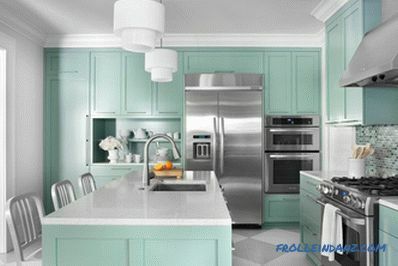 A light turquoise color in the interior of the kitchen will turn daily cooking from routine into a celebration. 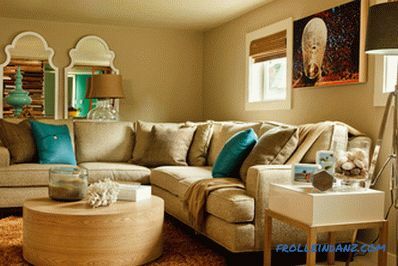 The pillows, which resemble the color of the sea blue, add a sense of coastal freshness to the neutral living room in clay tones. Photo: Garrison Hullinger Interior Design. Bright and bold colors and at the same time elegance are all about the balance of turquoise. Repeat the turquoise in several places to achieve a sense of balance. This is especially true when used as a color accent. Contrast fabrics, pillows, vases and glassware - all this helps to add bright turquoise spots to the interior without much effort. 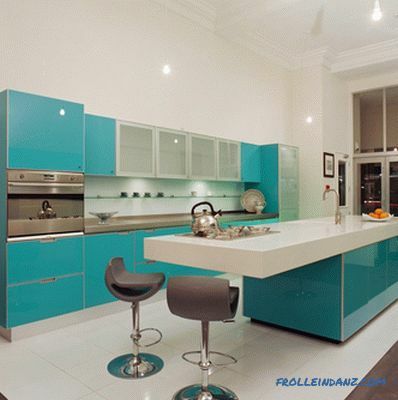 A glossy turquoise apron of glass in the interior of a modern kitchen. 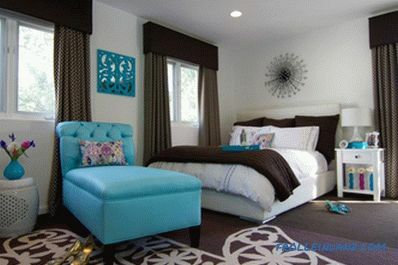 Even a hint of turquoise is enough to change the look of your bedroom. 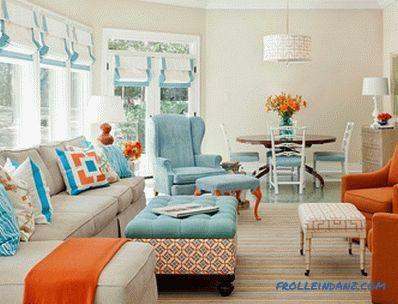 Beautiful turquoise accents, elegantly woven into the interior of the house. 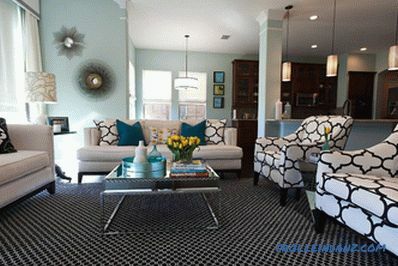 To create a sophisticated look, preference should be given to darker shades of turquoise. It is easy to transform the interior, causing light strokes of turquoise. 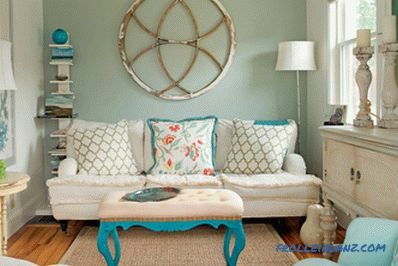 Turquoise touches will easily add brightness to your interior. 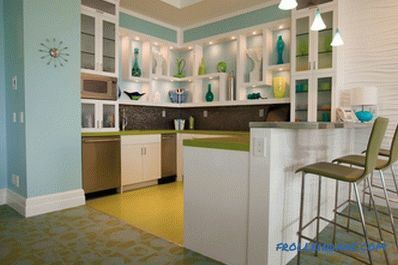 Transform your summer vacation home using the colors of the surf and sand. The turquoise hue you use does not have to be bright. The opinion that the color, in order to stand out in the surrounding space and create a lasting visual impact, must necessarily be very bright, is a fallacy, and a very common one. 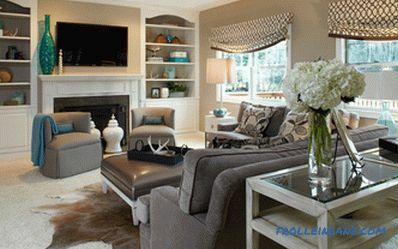 Designing a room and selecting colors is like painting on a clean canvas. The more neutral the background, the stronger the effect of the color used. The light color of aqua can be just as compelling a contrast as dark turquoise, if used correctly. 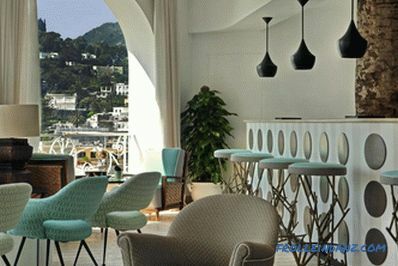 Turquoise molded plastic chairs are immediately in the spotlight. 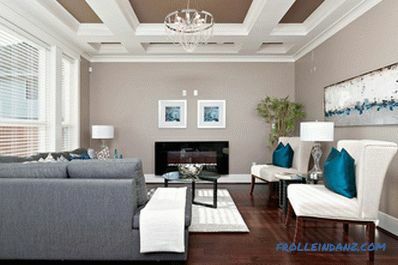 Elegant interior in white and gray with light turquoise accents. 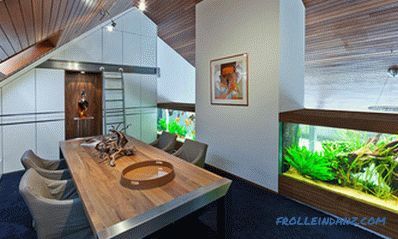 The glass surface of the table and the contrasting wall in the dining room with a turquoise aqua shade. There is a certain magic and charm in the deep colors of turquoise. Warm and mysterious shades of interiors made using such colors give them charm and uniqueness. Turquoise is a color that combines the brilliance of a precious stone, the freshness of nature and a feeling of relaxation, reminiscent of an exotic vacation away from home. In essence, it brings lively exclusivity to the interior. 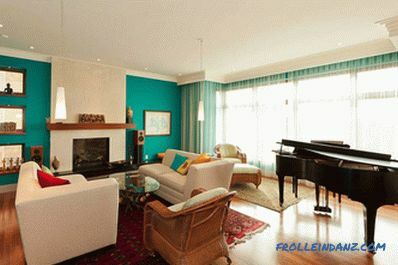 The eclectic living room, in the design of which random elements of turquoise are used. Photo: Sweet Peas Design. Susan Brunstrum. An elegant combination of warm yellow and cold turquoise. Vases and glassware are a popular way to add turquoise to modern interiors. 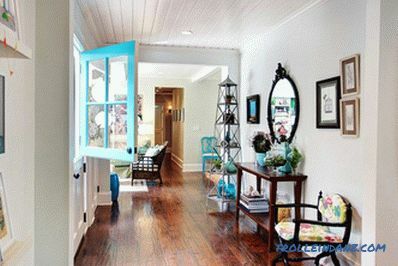 Turquoise in this interior evokes memories of the sea and the beach and gives some retro charm. 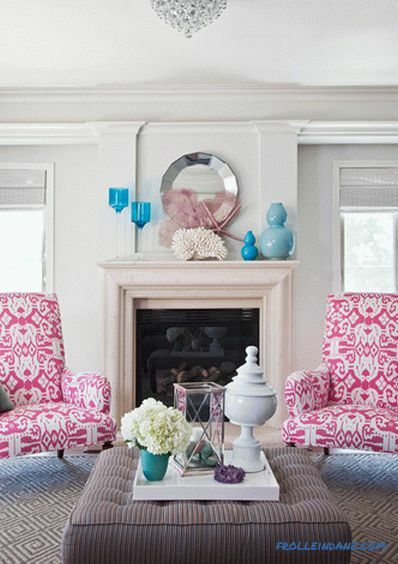 The pink upholstery and small turquoise accessories add some brightness to the white background of the room. Children's bedroom in light turquoise and white with yellow and lime accents. A combination of turquoise and blinding shades! What is the color that combines turquoise in the interior? Virtually any. 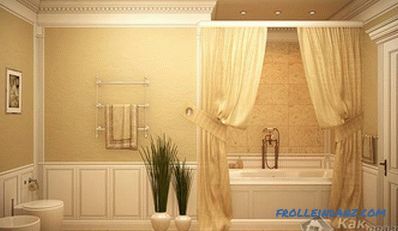 Combine it with light brown tones, and you give the room a vintage look. Mix it up with cool white and you’ll get the beach right at home! But there are colors that are not just good, but harmonize perfectly with turquoise. One of them is orange, which simply blinds, being placed in a pristine white room next to the turquoise elements. Lime green can also serve as an excellent addition to turquoise, as it brings both warmth of yellow and vividness of green. Golden yellow and black and white patterns that accompany the turquoise, create in the house a chic style of "Old Hollywood". 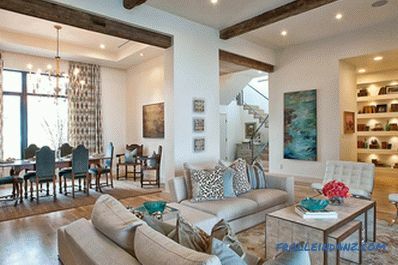 A simple combination of different shades of this color can give your home an attractive Mediterranean look. Aqua, turquoise and coral, combined together, give an amazing, elegant lightness! Photo: Tobi Fairley Interior Design. 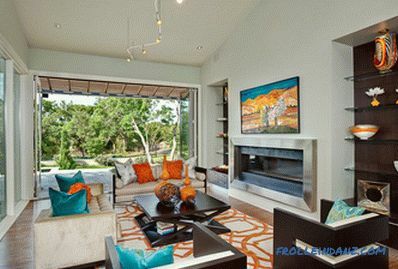 A bold and bright contrast of orange and turquoise accents. 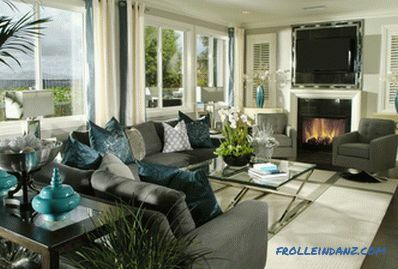 Photo: Decorum Home + Design. 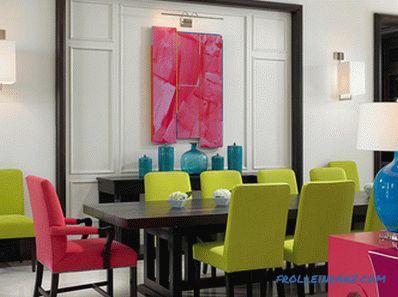 Turquoise, lime and fuchsia combined to create a bright dining area. 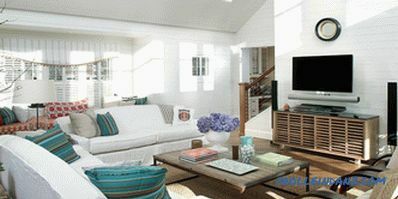 Photo: John David Edison Interior Design. Turquoise is a wonderful option that allows you to go beyond the usual colors, green and blue, and at the same time get the best of both. If you feel in doubt, if you don’t know what is the best combination of turquoise in the interior, then try to use simple color accents - pillows or vases, before starting painting. 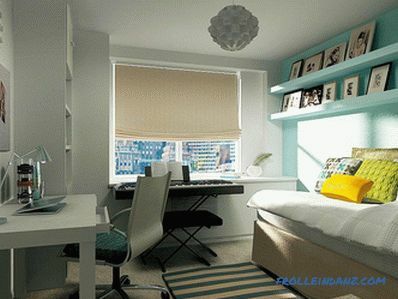 You will surely enjoy the new, rich-colored image of your room! Photo courtesy of Cre8tive Interior Designs. 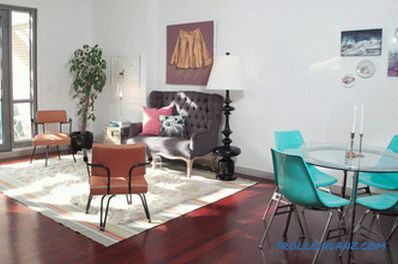 A pair of contrasting turquoise chairs for a cozy conversation. Photo courtesy of Pampa Tiles. 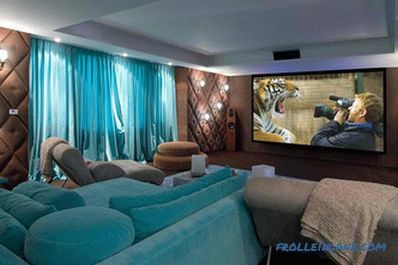 Chocolate and turquoise teamed up to create an excellent home theater. 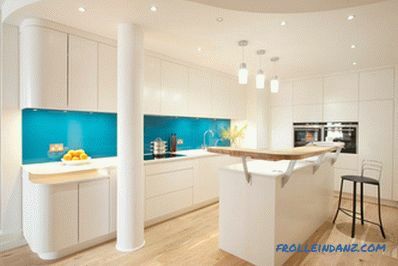 Magnificent kitchen cabinets combining white and turquoise. Photo courtesy of Mal Corboy Design and Cabinets. 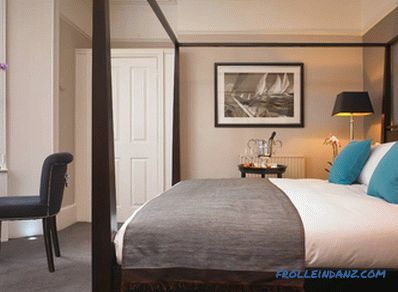 Light and warm shades of turquoise in the interior of the bedroom will help create a relaxed atmosphere. Photo courtesy of Nicole Benveniste Interior Design. A light touch of aquamarine in the bathroom. Photo courtesy of Glass Tile Warehouse. Any shade of turquoise near the pool - a marriage made in heaven! Photo courtesy of Bonick Landscaping.